"RETURN TO A GALAXY FAR, FAR AWAY." "RETURN OF THE JEDI" was originally released to the theaters in 1983. 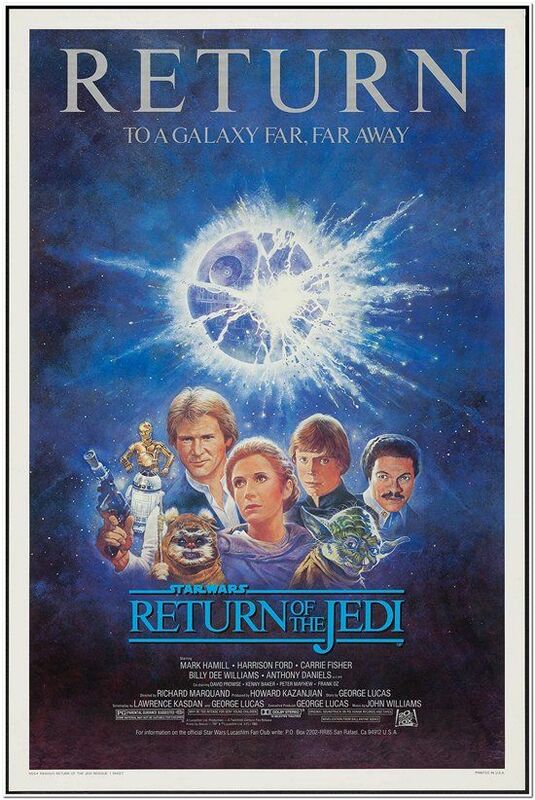 In 1985, Lucas Films brought the movie back to the big screen and developed an entirely new advertising campaign for it - including a newly designed movie poster. THIS IS IT!!! The poster is approx. 27 x 41 inches in size, rolled and in near mint condition. It is an original poster, 1-sided, NEVER BEEN USED and HARD TO FIND. It has the National Screen Service Number of R850025 in the lower left hand corner of the poster. It has been stored in a dry, smoke-free home. This is NOT a worthless reprint or a video poster - BUT AN AUTHENTIC STUDIO ISSUED MOVIE POSTER!